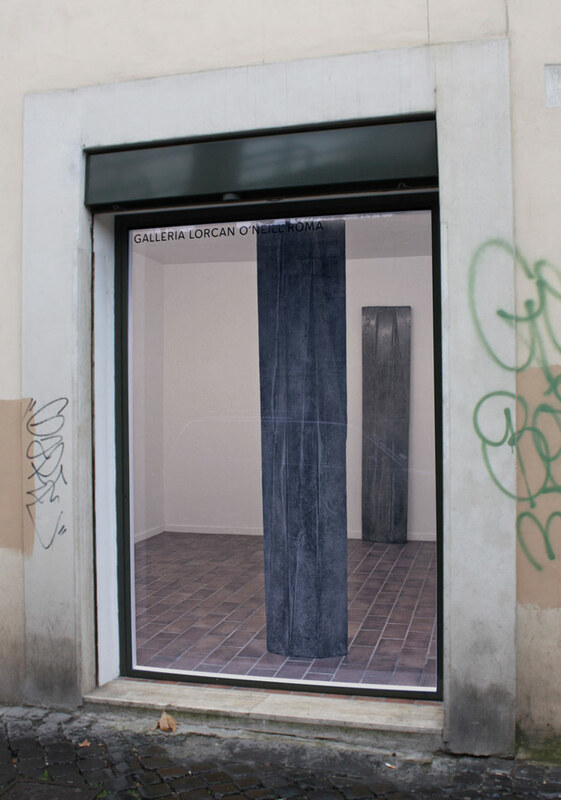 Galleria Lorcan O'Neill Roma opens its fourth Street View exhibition in the gallery's project space on the corner of Via Orti d'Alibert and Via della Lungara, with the exhibition The Look of Touch by the British artist Michael Dean. In recent years Michael Dean has worked with concrete, producing leaning monolithic slabs with intricate surfaces that display a personal alphabet of angles and indentations. His works have their root in his own writing, texts that create an impenetrable and illegible mode of language in relation to which the reader/viewer can produce their own meaning. The writing is reduced into abstract geometries to create alphabetically ordered forms which are then cast in concrete. Two large works both daily (working title)lean into, against and out of the space. From the street, the viewer faces a work through glass. Suggesting a symmetry by way of the reflective surface of the window pane in which both viewer and street are reflected, included, implicated. On entering the space the whole of a work becomes available in the repetitious presence of a two faced, doubled work. A physical intimacy is proposed. On encountering both the face of the front and back of the work daily (working title) we no longer have the potential resistance of distracting glass, rather the glacial quality of the work functions as though in anticipation of touch with its reflective and tactile availability. For his exhibition in Rome, Michael Dean has created specific works which ruminate on the relationship between the viewer and the monument. Surrounded by Rome’s multi-layered history, he asks what happens at the moment when a monument returns to nature, returns to its monolithic state from which it came. And how does that material relate to the presence of the viewer, our own physical presence, our neck and throat and our voice. Our Daily Permanence, the other part of the project developed by Michael Dean in Rome, will be showing at the Nomas Foundation, Rome from December 9 to February 25, 2011. Michael Dean was born in Newcastle Upon Tyne. He lives and works in London. He has had solo shows at Supportico Lopez, Berlin (2010), Independent, New York (2010), Scaramouche, New York (2010),FRAME/Frieze, London (2009), Works Project, Bristol (2009), Galleria Alessandro De March, Milan (2008) Feurig59, Berlin (2008) and the Guestroom, London (2007). He has participated in group shows at, amongst others, the Henry Moore Institute, Leeds (2010), Wendt and Friedmann Galerie, Berlin (2009), GAM Museum of Modern Art, Turin (2009) and the Bilton Centre for Contemporary Art, Red Deer, Canada (2008).